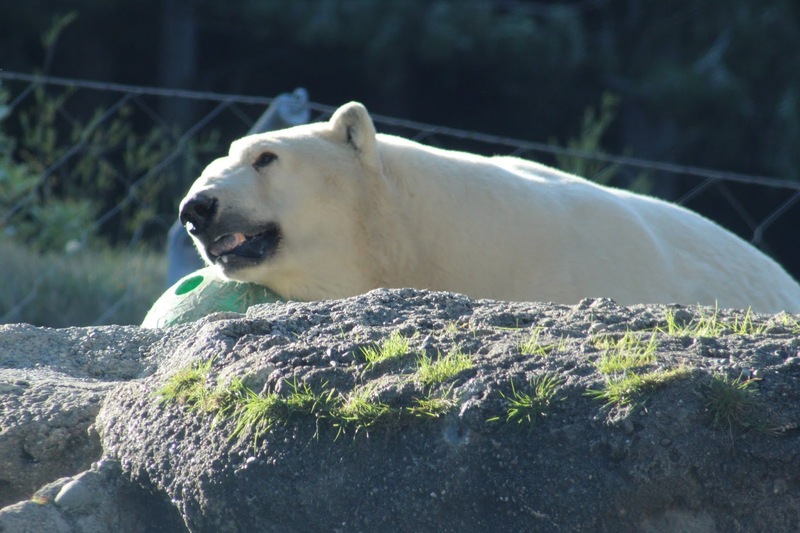 I had been wanting to visit Boris and Blizzard in Tacoma Washington for years. 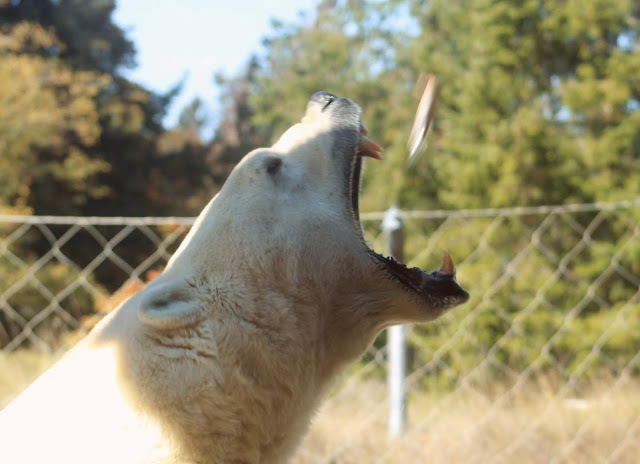 Boris, after all, was one of the rescued Mexican circus bears, one of the “Suarez 6. ” I was fascinated with his story. He was born in 1985 in Germany, worked in the East German circus for years, then was sold to a traveling Mexican circus. He and his fellow polar bears, starving and mistreated, were finally rescued and sent to U.S. Zoos in 2002. Boris is the oldest male polar bear in U.S. zoos, and he has a very special story. He is getting up there in years. I wanted to visit him before it was too late. I finally scheduled a trip to Seattle Washington to meet Boris at last, in the beauty of the Autumn season, staying at SEAtac airport, to be close to bus and rail lines. I arose early on that foggy Thursday morning in order to take the first of three buses to get me to Point Defiance Zoo. It took over two hours to get there, and then a long walk up the hill to the zoo entrance. 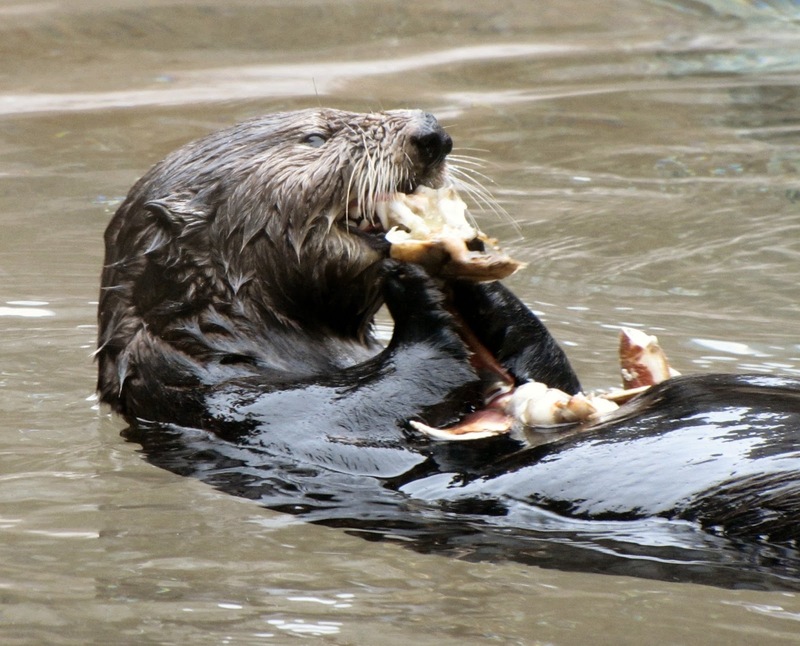 Point Defiance Zoo sits on a peninsula jutting into the Puget Sound, bordered by a beautiful wooded park. 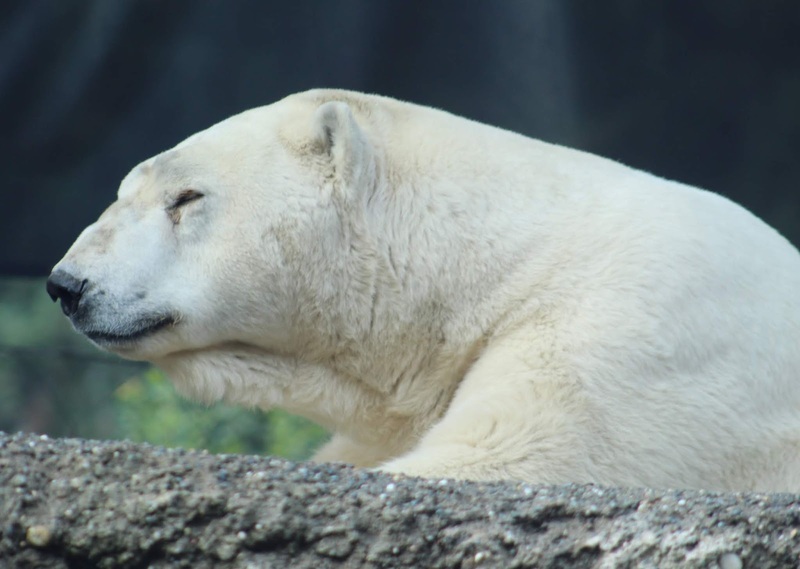 I have learned that in earlier days, the polar bears were situated by the Rose Garden of the park, each with a cage and a pool. In those days, the park covered more ground but had fewer animals. The park today focuses on animals of the Pacific Rim, and wildlife of the Tundra. 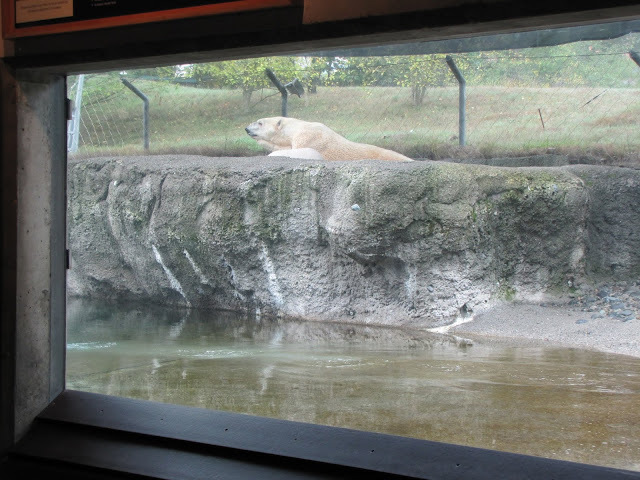 The current polar bear enclosure may be the oldest in the country, built in 1982 and filled with river-stone, no grass, but a rather nice large salt water pool for the bears. There are two big flat stone resting places in the enclosure, and it is all seen through glass in the two rooms of the sheltered viewing house. You cannot see the bears from any other vantage point. On that Thursday morning, Blizzard was taking a nap on one of the elevated rocks. The pool was empty, but just starting to fill up. The keeper talk is set for 11:30 every morning, and it was there I found out from Sheridan, one of the polar bear keepers, that on Thursdays the pool is drained and cleaned, and they don't let Boris come out when the pool is low for safety issues, because he is so old. I would have to be content with Blizzard for that day. To see Boris, I would have to return on Friday. Another early morning in the fog, another long series of bus rides. Blizzard catches fish thrown from the roof. He is pretty good at it. Sheridan told the crowd all about polar bears and Blizzard and Boris in particular. She answered my questions, and then went outside to throw Blizzard some treats. These bears insist that the keepers cut the heads off the fish, Sheridan cuts them in half so the bears think they are getting more. They have trained the bears to sit, like a dog, on a scale and they are weighed weekly. 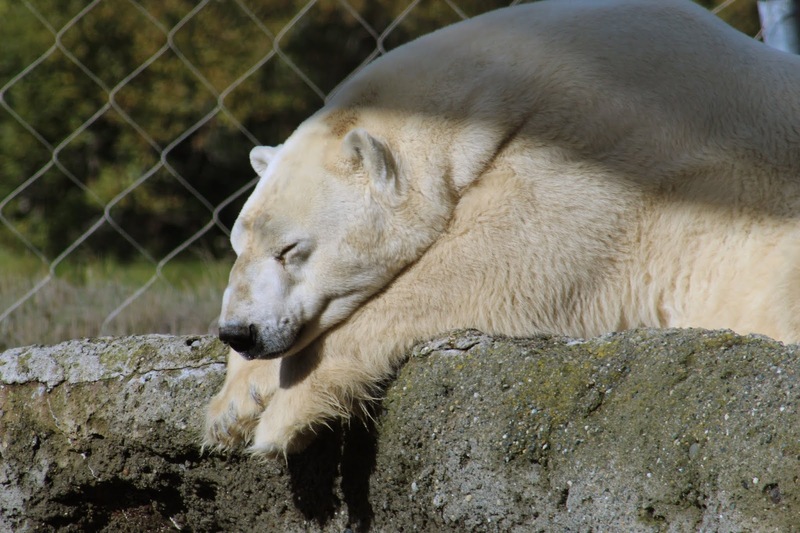 In nature, polar bears tend to eat a lot in the spring and summer, and it tapers off in the fall. 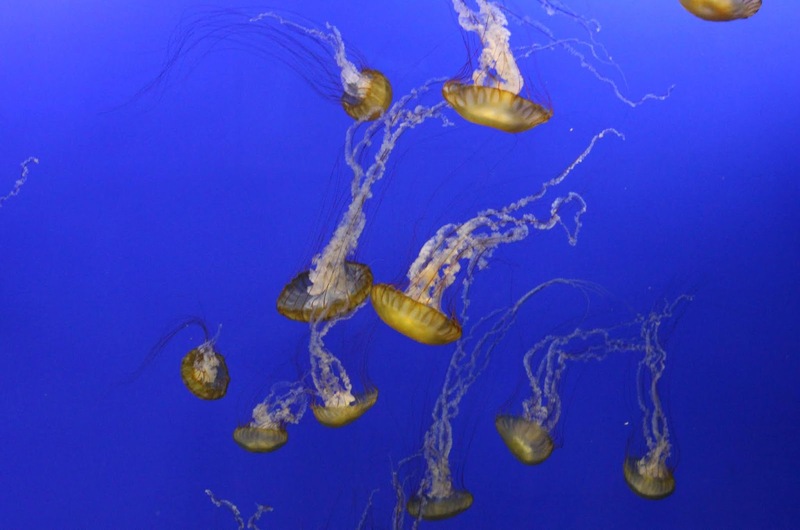 The Tacoma Zoo follows this pattern. 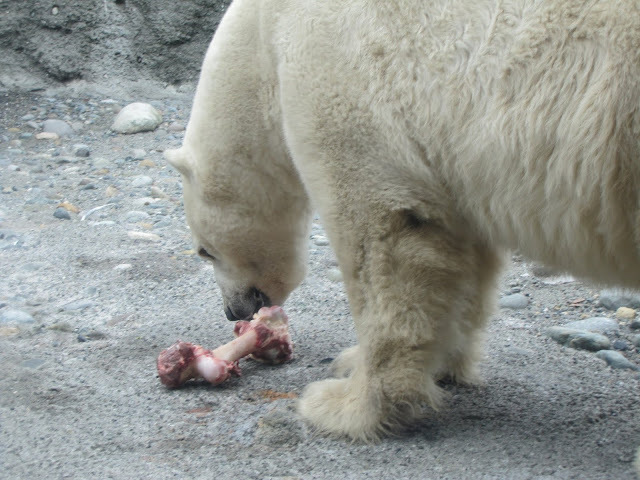 22 year old Blizzard weighs 1125 pounds right now, and they want him to lose a little more weight, so he gets only three pounds of food each day currently, plus maybe a bone with shreds of meat and marrow to chew upon. Blizzard's favorite food is melon. He just loves it. He doesn't like lettuce at all. to make him think he is getting more food than he really is. 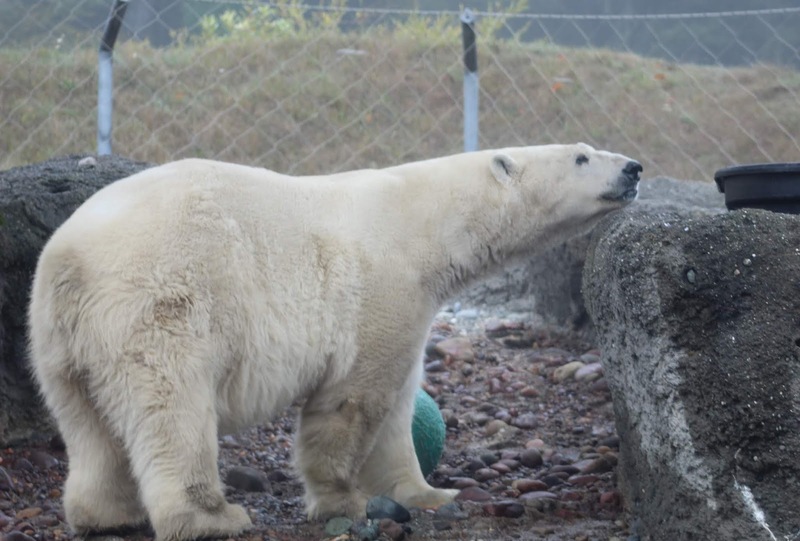 Behind the scenes, Boris, who is almost 33 years old, weighs 911 pounds right now. 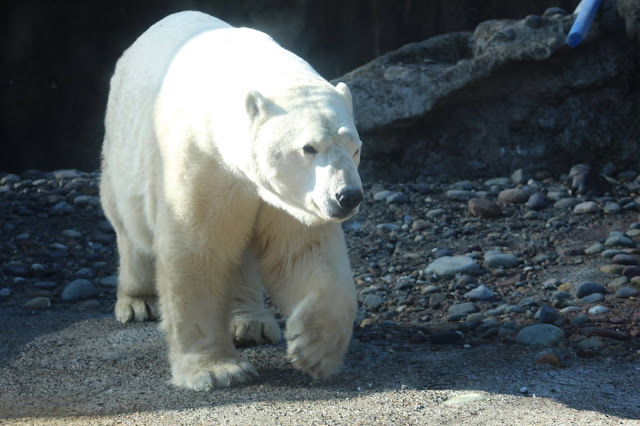 Last spring he underwent experimental stem cell treatments for his arthritis, the first time this has been done for a polar bear. The stem cells are cultured from Boris' blood, and then injected into his bloodstream. The first treatment gave him a lot of relief, but the second time did not help him much. It is better for his joints if he weighs less rather than more. He gets six pounds of food a day currently. His favorite food is lettuce, maybe because that is what he was fed during his time in the Mexican circus. He does not particularly like melon. Both bears are trained to present parts of their body for medical examination, and their hips and shoulders for injections if needed. 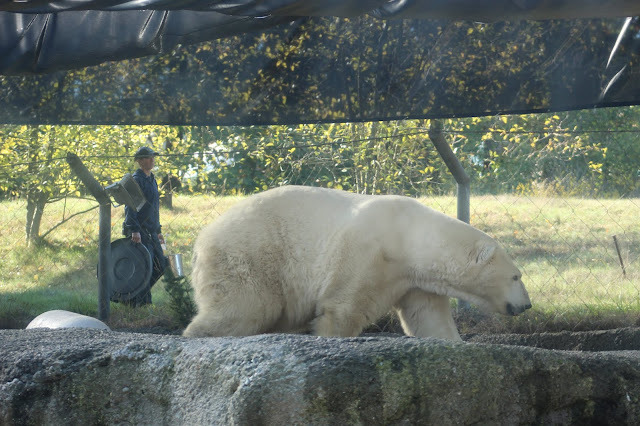 The keepers have devised a box in which the bears voluntarily place their heads for eye drops. Boris gets eye drops several times a day. He gets supplements for his arthritis, and also had several abscesses on his right front foot that the keepers were keeping an eye on. I was assured that Boris has lots of soft straw and hay in the bedroom area, so he can sleep comfortably. On that Thursday morning, I was told that Boris was inside, having a great time playing with his toys in the indoor pool. I checked on Blizzard several more times on that Thursday. 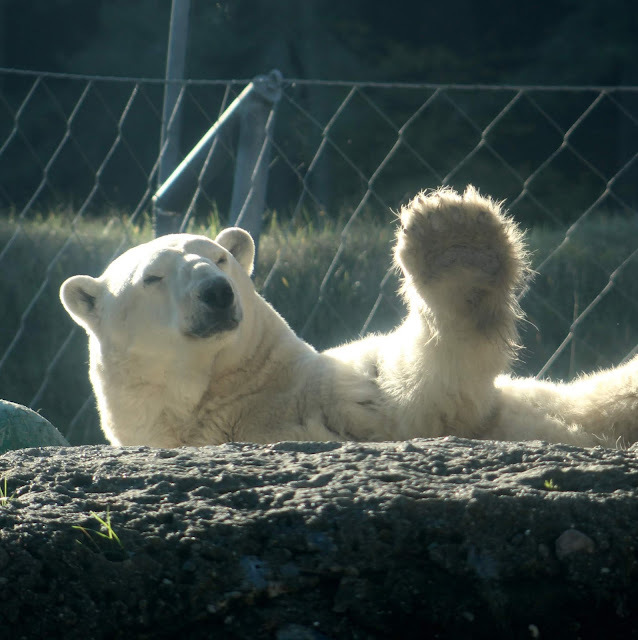 Blizzard and his twin brother Glacier were rescued as cubs from Churchill in Canada, and after a short stop in Calgary, came to the Point Defiance Zoo in 1987. Glacier died in 2015 at the young age of 19, from liver cancer. 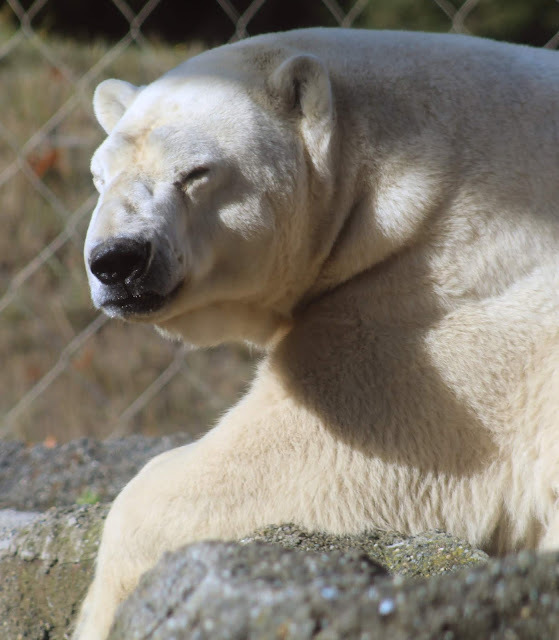 Glacier is thought to have been the first polar bear treated with chemotherapy for cancer, which greatly improved his quality of life. Glacier had been diagnosed in February 2015 with liver cancer and a heart murmur. The zoo veterinary staff searched out experimental treatments that might help him. Chemotherapy and heart medications gave him more time and made him feel well enough to eat and play and interact with his keepers again. But sadly he did succumb to the disease eventually in November of that year. 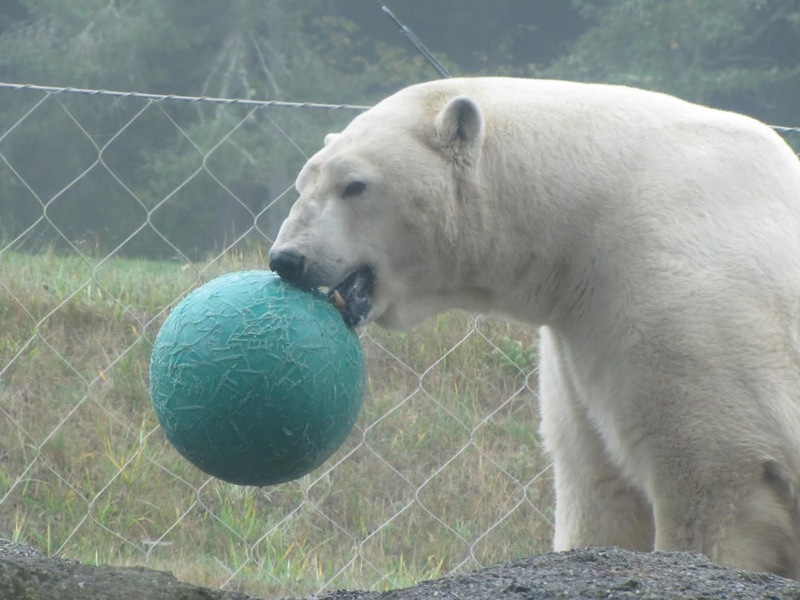 These experimental measures may help other zoo bears in the future. At one point, there were four bears living in that habitat. 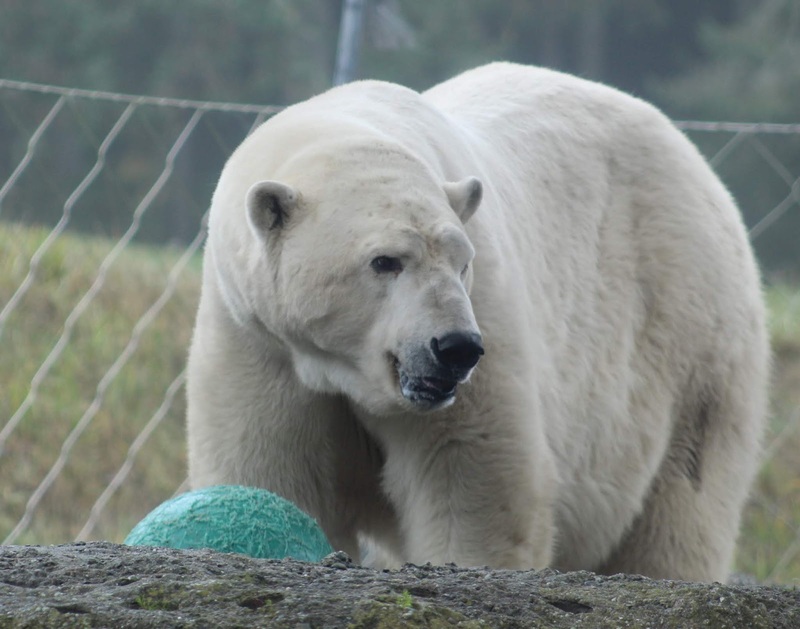 Another of the “Suarez Six” polar bears was Kenny, who died in 2012 at the age of 27. 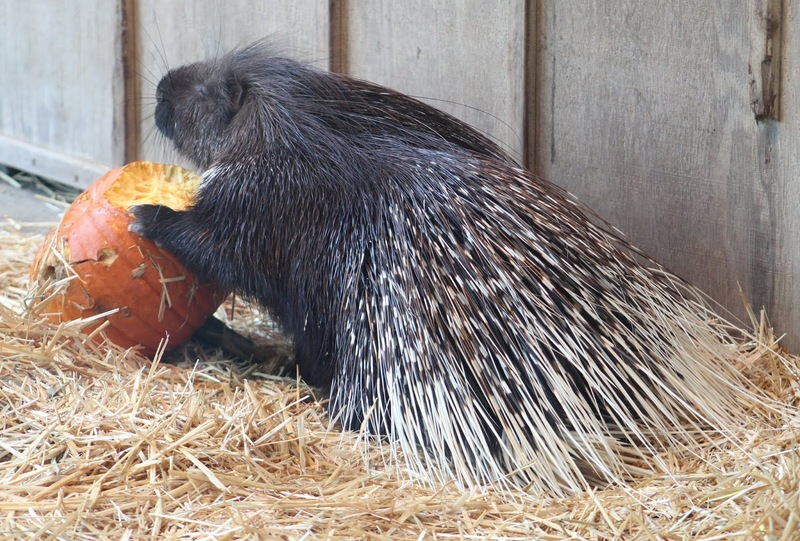 Kenneth, or Kenny, had been born in the wild in Canada, but ended up in the East German circus system with Boris. They and other bears had been sold to the Suarez Brothers Circus in 1999, and finally rescued by the USDA officials in Puerto Rico in 2002, Shortly after Kenny arrived, he underwent a five hour dental session with human dentists, getting root canals, extractions and fillings. Both circus bears were in terrible shape when they arrived, but got the best of care in Tacoma, and their health rapidly improved. When there were four bears in residence, the keepers rotated them, with two outside and two inside. Now just Boris and Blizzard are left. The door is always open to go back inside if a bear wishes to. 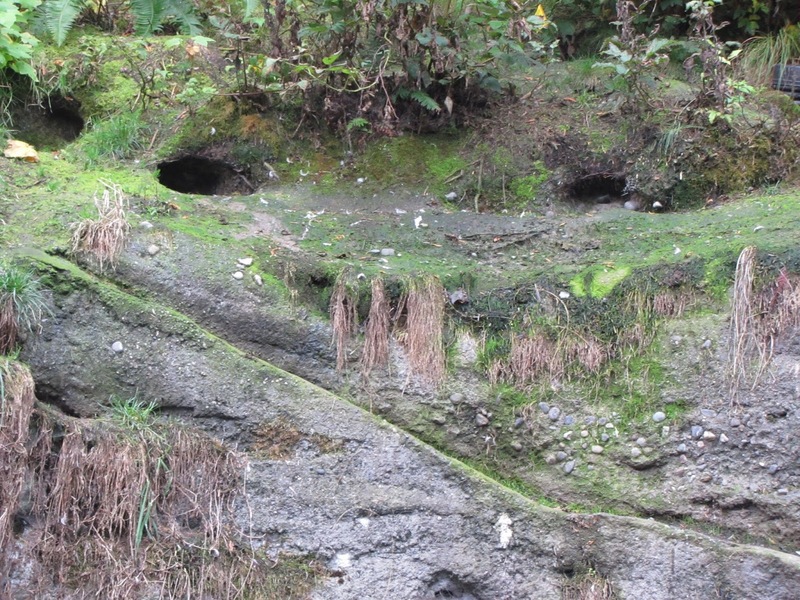 I wandered around Rocky Shores to visit the three lady walruses, Basilla, Joan and Kulu. The male on loan from San Diego SeaWorld has just returned to California, leaving behind the possibility of a pregnant walrus. 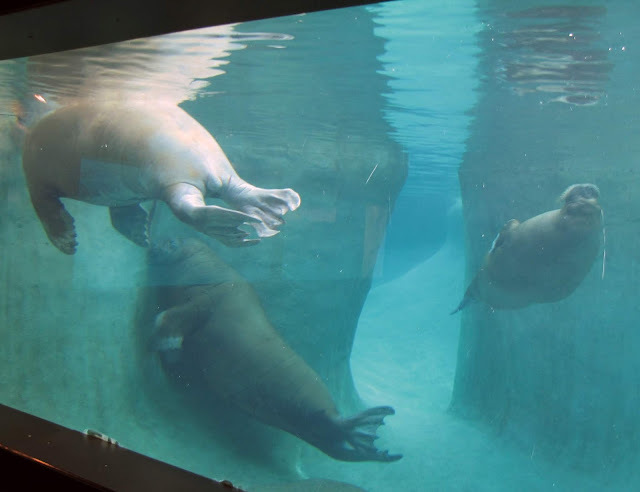 A a new underwater viewing area for the 125,500 gallon pool gives an amazing view of the walrus trio up close in swimming mode. 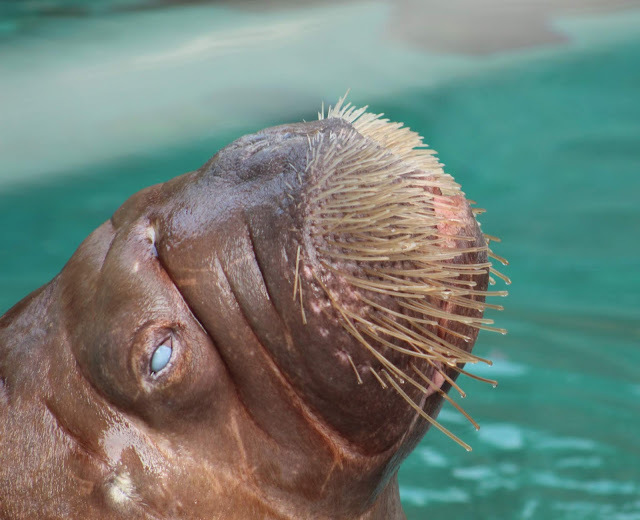 Very few zoos keep walruses, so this was a nice opportunity to study them up close. One of the lady walruses seems to have eye issues? 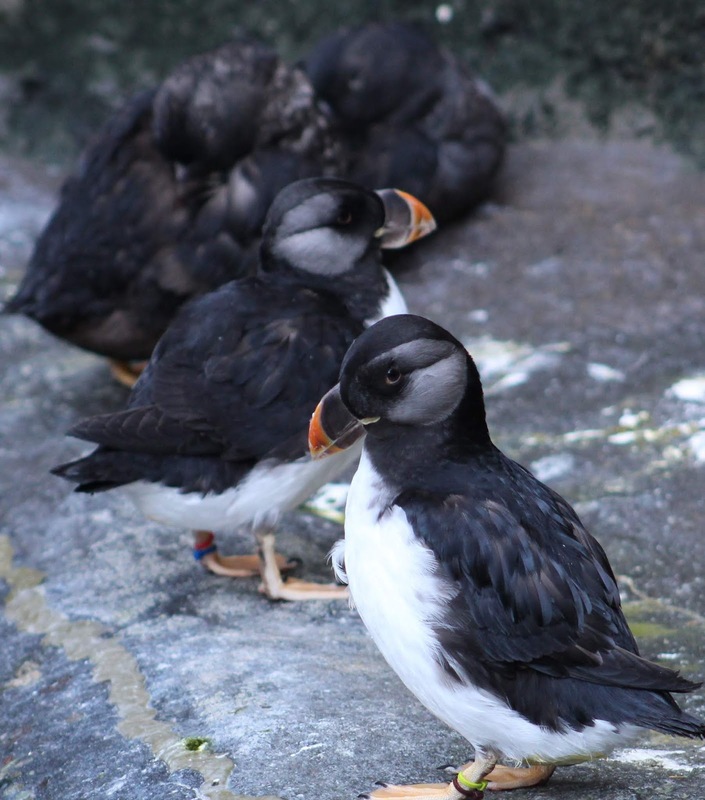 The zoo also has Horned Puffins and Tufted Puffins, two of the three kinds of Puffins, in a natural setting complete with cliffs where the puffins can lay their eggs and raise their babies. I have seldom seen Puffins in a zoo, and never in a natural breeding habitat such as in the Point Defiance Zoo. These two kinds are the Pacific puffins. 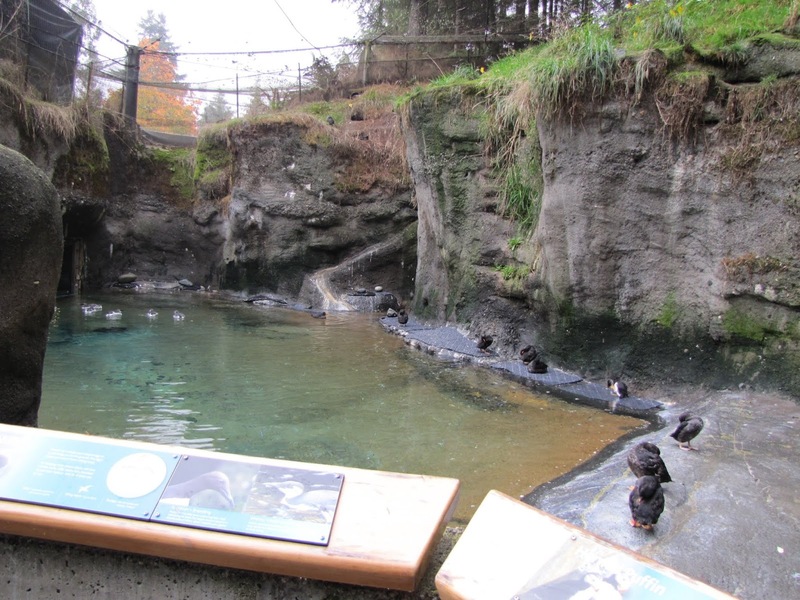 The puffin area, shared with the Common Murre. You can also meet the Sea Lion and the otters, Arctic foxes and Musk Oxen. The Point Defiance Zoo is active in a breeding program to repopulate the almost extinct Red Wolves in the Northwest and elsewhere in the country. The population had dwindled to just 14 individuals in the 1970s, but has bounced back to 50 wolves in the wild, and about 200 in the captive breeding program. The wolves have been temporarily removed from the zoo to another sanctuary during construction of the nearby picnic shelter, since the wolves are very sensitive to outside noises, so I did not see the wolves. 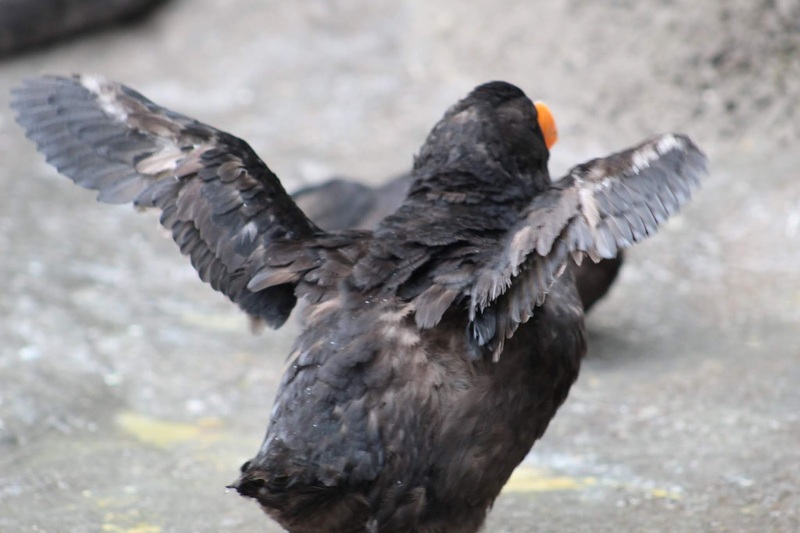 The breeding program has been successful, but now political agendas are getting in the way of repopulating. 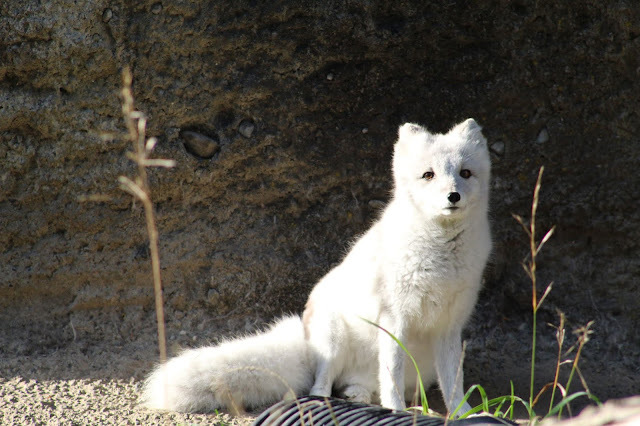 The Asian area features many kinds of animals who are rotated through the different exhibits every day, and are thus exposed to new and interesting scents. Here you can see porcupines, Sumatran tigers, White cheek gibbons, Simians, a pregnant tapir couple, and many other animals. Nearby is the elephant home with two elderly lady Asian elephants, and the keeper talk is always worth hearing. 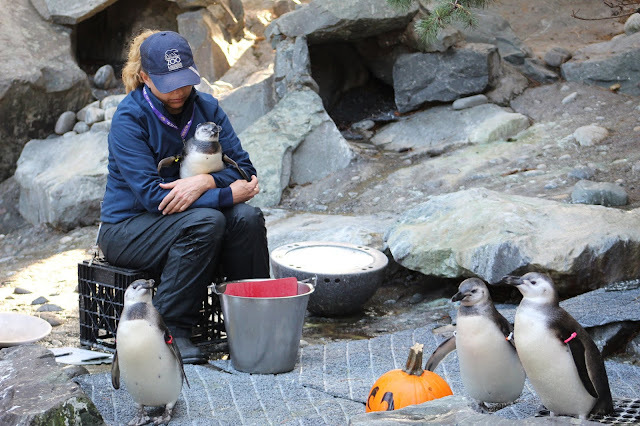 Keeper holds Luna, the youngest chick of this flock of Magellanic Penguins. 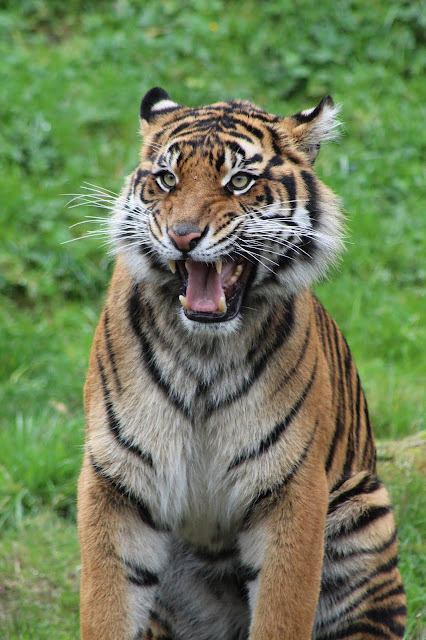 Most of the keepers at the Point Defiance Zoo are women. I also stopped by the Magellanic Penguins to meet the new chicks. The newly opened South Pacific Aquarium is just beautiful. The tanks are so gorgeous you might think they are high definition digital images, but they are real. The jellyfish floating the the giant globe are surreal! 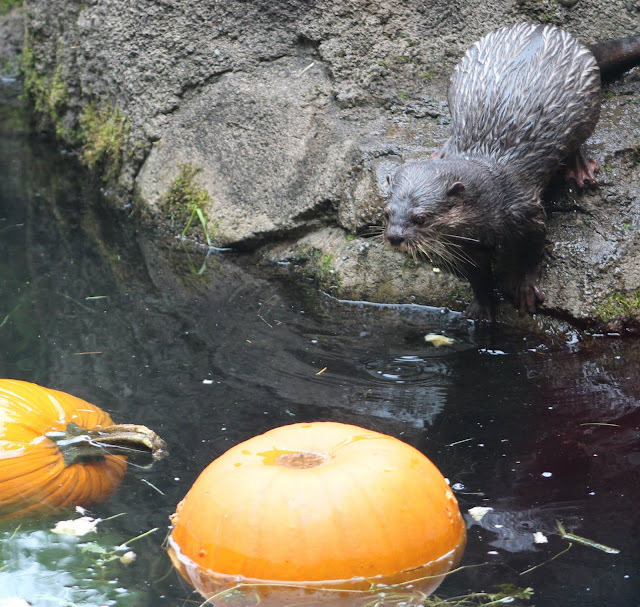 The zoo has a second, older aquarium too. 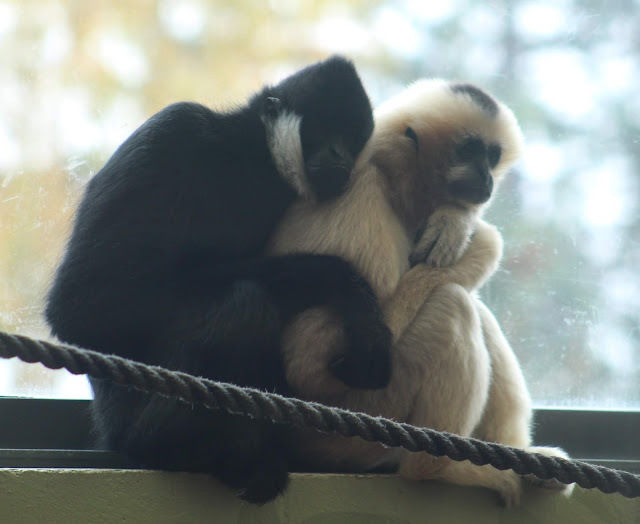 The Point Defiance Zoo is built around a central plaza which offers a breathtaking view of Mount Rainier. Dear Molly! I have only watched the photos and I love them! I'm sure I will love the text, too, which I will enjoy tomorrow! I love the idea of an old bear from the Cold War time living in peace and security at Puget Sound where the US Navy keeps and builds the ships that kept my country safe. The US rescued these East German bears when the new rulers in Germany had treated them as objects to be sold. I cry but seeing Boris reminds me of why I still love the US of A whoever is in charge.